Over the past two weeks I have managed to get a fair bit of climbing done, both in the Lakes and in the awesome Scottish mountains. Now that winter has returned and that it looks to be around for a while, I will hopefully be getting a lot more done soon. Two weeks ago today I headed down to “The Works” which is a relatively newly developed tooling venue in the Lake District. 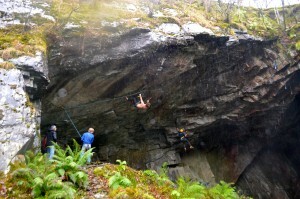 It is a brilliant place, and the potential for more easy and hard routes is unbelievable! If all the potential line were to get bolted it would definitely be on par with some of the best mixed and tooling venues in the world, it’s just so big! I’ve been down there a couple of times now, and apart from the most recently bolted lines, I have pretty much done all the routes at this venue. There is a bunch of lines ranging from D4-D12 with some awesome 3 star climbing to be had throughout. On my Last visit I met up with Richard Armitage who belayed me as I made the second ascent of “Guardian of the Underworld” D12. 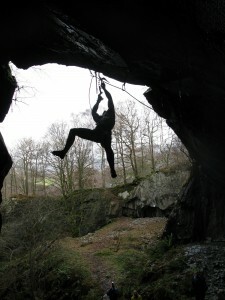 This was a route that I had tried on my previous visit to the Lakes. I also managed to bolt a steep and cool looking line of my own while I was there, and I’m looking forward to getting on it next time I’m down. I’m hoping to get down there again soon, but for now the winter conditions have returned, so there is only one place I want to be….in the mountains! On Sunday Guy and I headed over to the Ben and up to the CIC hut in preparation for an early start on Monday (yesterday) morning. As we walked up to the hut, leaving the car at 9:30pm, we didn’t need to turn our head torches on once. The moon was beaming down and lighting up the sky, and we had an awesome view of a very wintery Ben Nevis for the whole walk in. 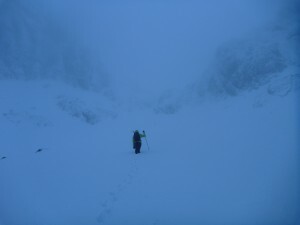 Yesterday we got up at 6am, ate our grub and headed off up towards Tower/Gardyloo Gully in search of our intended line. After walking through deep unconsolidated snow for a good while, the snow pack started to feel a little suspicious, and when it was time to enter the narrow gully to the left of “Tower Scoop”, I knew it didn’t feel right. I dug a pit and checked the snow, and straight away we both knew it was a No Go area. Now a little spooked by the overwhelming feeling that we were two very small people on one very big and currently, very treacherous mountain. 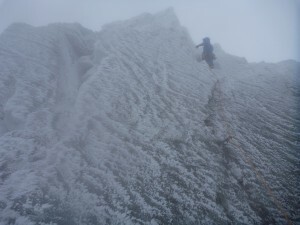 We turned around and opted for a look at a different line that we had passed on the way up. 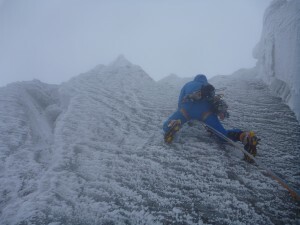 As Guy moved off right in the howling wind to reach the safety of the buttresses and out of the gully, a small (10ft wide, 2inches deep) section of the slope detached from above him and for a split second he went completely out of view under a light wave of snow. The next thing I saw was a very snowy Guy making a hasty retreat back towards me and then we both pegged it back down the way we had walked up and away from the loaded snow areas. 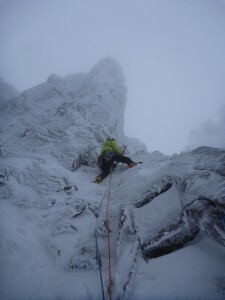 We then walked around to the bottom of the Douglass Boulder, where we had intended to climb, but as we reached its base, the cloud and mist lifted to reveal a very wintery and very tempting looking No.3 Gully Buttress area. Even though we knew it would be fairly late in the day by the time we reached No.3 area, after having walked up and down through deep snow for the past three hours, we also knew that it would be rude not venture up and climb something with the crag in its current, perfect condition. 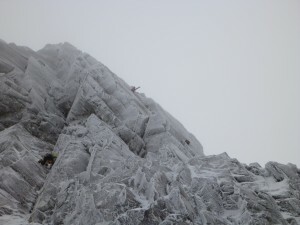 So we headed up and jumped on the line that I had done last season with Will Sim, called “Knuckleduster”. Even though I had climbed this line before, I was happy to get back on it, as it was home to some amazing climbing and I also knew that there was a direct variation to the crux second pitch to do, and that is exactly what we did. 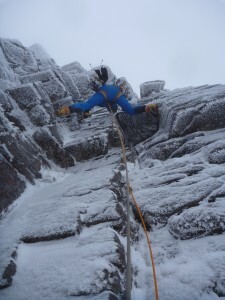 Guy lead off up the first pitch, leaving the ground at around 11:30 and got stuck into the brilliant mixed cracks and bulges that the Ben has to offer. After a thin start and some funky moves, he pulled up onto the belay and I swiftly joined him after seconding. I then went on to lead off up the icy groove that is capped by an imposing broad roof. 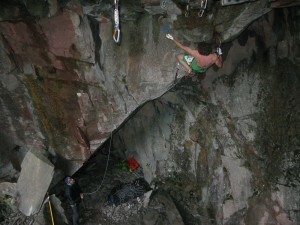 I arranged some gear on the wall beneath the roof and then got absorbed by the good hooks and enjoyable climbing. I blasted upwards filled with enjoyment from the awesome climbing, but that feeling was soon replaced with the dull sick feeling of fear that you get when you realise that things just got a bit more serious. I had realised that I had been too absorbed by the good hooks on the steep ground, and suddenly all of a sudden the good hooks disappeared, and so did the opportunity to get good gear. My last good runner was now quite far below me and I was weighting a less than ideal hook/axe placement trying to fiddle in some protection. I managed to tap in a crappy turf hook and a small cam in an icy placement, but the only option in my head was to continue up and gain the awkward ledge on the original route of “Knuckleduster”. So after some heart in my mouth, ballancey and super thin moves, I reached the safety of the ledge and the good gear. I then (after some toing and froing) pulled off the ledge and up to belay as for the last time I was on the route. Guy then came up and joined me and proceeded to head off up the 3 star corner pitch that cuts its way through the centre of the buttress. I was looking forward to climbing this pitch again after seconding Will on it last season, and I knew how good and how much fun it was to climb. After that pitch it was just up the last short wall for me to reach the top of the buttress and then to the rap point at the top of “Gargoyle Wall”. Me venturing into a sea of steepness! Even with a slightly bolder second pitch then the original route, I don’t think the new section of climbing changed the grade of “Knuckleduster” much, so VIII/9 still seems fair to me. We then returned to out bags, then headed down to the hut in a fairly strong wind that had been buffeting us for most of the day. But even though we were a bit tired from snow wading in the morning, steep climbing throughout the day and a wind blasting in the afternoon, we both still had big smiles on our faces, as all these things are what makes winter climbing so much god dam fun! !……lets hope it continues. There was also another teams on “Sioux Wall” and a team around South Trident area, making the most of the awesome conditions. 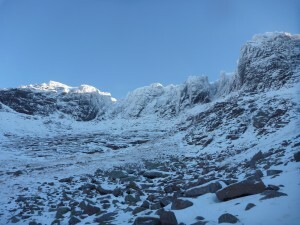 Coire an Lochain in all its glory! 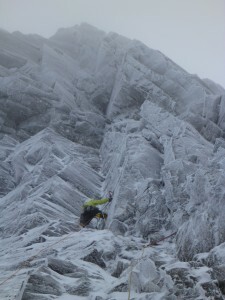 So winter has arrived… On Saturday I managed to get out into the hills with Dougie. Hoping to find some winter conditions, Dougie, Adam, Lindsey and I headed up into Coire an Lochain full of early season psyche and anticipation. To our joy, we found pretty much every route in condition, baring one or two super steep lines that hadn’t caught the wind/hoar. So Dougie and I headed off in search of a potential route while Adam and Lindsey headed off to do “Hookers Corner”. We opted to get on the classic line of “Bulgy” which skirts its way around two distinctive roofs. 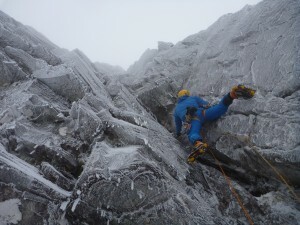 It was a good route and after Dougie had quickly dispatched the first pitch, I made my way up the trickier second pitch. I didn’t have any big gear to protect the crux moves around the roof, so I awkwardly stacked two hexes in the crack and with some reassurance from this, made my way up the rest of the route and to the top. It was awesome to get out in the hills in winter conditions and it felt good too blow away the cobwebs on some mixty moves! I also managed to get out again yesterday with Guy Robertson, were we ventured back into Lochain for a quick tick of a new line that Guy had mentioned to me earlier last week. We took a line that follows a steep crack and stepped niche to the right of “The Gathering”. It was a fun wee route that packed a pumpy punch at its start and some awesome varied climbing higher up. 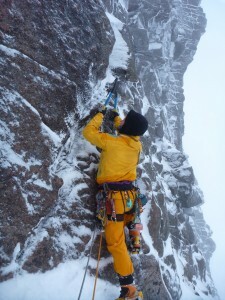 Guy on P1 of "The Candy Shop"
Whether it was early season rustiness or lack of concentration, but I popped off the very start of the crux pitch when my foot blew off its placement and simultaneously so did me axe as I was down-climbing back to the ledge after placing some gear. I was a bit miffed to have slipped off as I felt totally fine, but at the end of the day that’s what winter cranking is all about….the unexpected and unknown, and that’s why I love it! Another unexpected occurrence on this route was after I had climbed the first overhanging crux crack (from the ground again) and I was moving up the niche, my foot slipped off the placement it was on and for some unexplained and unlucky reason my crampon plummeted down into a world of wind and spindrift (not attached to my foot I might add). Thankfully it landed at Guys feet on the small ledge that he was belaying from, and I was able to down-climb with one crampon to a point where I could to hang from one tool and pull/lower a rope to Guy to retrieve my crampon. I did this and managed to put it back on without having to sit on the rope/any gear, which was tricky, but satisfying as I was able to make a clean ascent of the awesome new “The Candy Shop” VII/9**, and our first (hopefully of many) new route of the season. Me on P2 of "The Candy Shop"
It was ace to get winter climbing again and now I’m just psyched to do much much more….so watch this space for updates soon! Me finishing the crux of "The Candy Shop"